When I first started reading, “The Emperor of Lies” I was a bit daunted by the size of the book – 700 pages and that too of Holocaust literature, I was almost prepared to be depressed and miserable. However, I soon realized that there are times in life when may be one has to read a certain book for the sheer power of its writing and not always because of the content. There have been a lot of books written about the Holocaust, so much so that it has become a genre in its own and to add to this is, “The Emperor of Lies”, by Steve Sem-Sandberg, translated competently by Sarah Death. The Emperor of Lies is a fictionalized account (but of course) of events from the actual archives of Poland’s Ghetto from September 1942 to January 1945. This ghetto was the second largest in Poland set up by the Nazis as a holding center to transport Jews to the concentration camps. The “Emperor of Lies” was Mordechai Chaim Murkowski, a 63 year old Polish Jew, who was appointed by the Nazis to take charge of the ghetto and its functioning. In the book, he is known as the Chairman. Murkowski before the Nazi regime was a prosperous businessman. Although he reported directly to the Nazis, he had an authoritarian rule over the Jews at the ghetto. His primary function was to ensure that the ghetto was provided with electricity, work, food, heat, housing, and health and welfare. There are two coins to every story. While Murkowski was responsible for keeping half the Jew population in the ghetto alive by making them manufactures a variety of goods for the German Army. This ensured that this ghetto was the last to be liquidated. While Murkowski believed in, “Work sets you free”, he also is portrayed to be ignorant, vulgar, power-hungry, who was attracted to women and children. On one hand he is made to seem to be a Nazi collaborator and on the other, shown to be a saviour of the Jews. The book is hard hitting. Sem-Sandberg takes the reader to the very heart of evil and makes you see things as they were in those times. 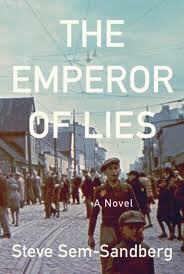 The Emperor of Lies also gives voice to quarter of a million Jews of Lodz who vanished without a trace. He paints an honest picture of corruption at the Jewish Ghetto Administration Council. The novel is unique – in the sense that it provides a complete picture of Murkowski and his actions. It does take sides and does not want the reader to. The Emperor of Lies does not paint a pretty picture. The reader will cringe in most places and might be tempted to let go of the book. However this is a different take on the Holocaust. A book that you should read if you want to know more about those times. This entry was posted in Books, House of Anansi Press, Literary Fiction, Review and tagged Concentration Camps, historical fiction, House of Anansi Press, jews, literary fiction, nazi, Poland, Steve Sem-Sandberg, The Emperor of Lies on November 12, 2011 by thehungryreader. 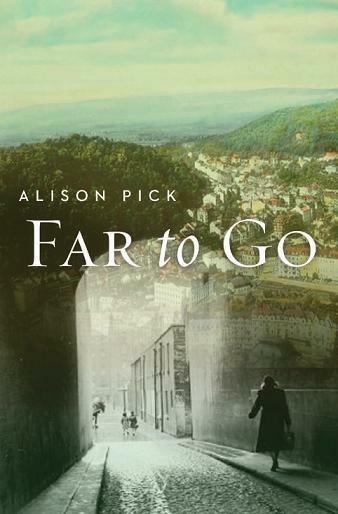 Far to Go by Alison Pick is one of the best reads for me this year. It made me realize a lot more in-depth about the Holocaust and its aftermath, that may be I wasn’t aware of earlier (This was before reading “The End” by Ian Kershaw). The entire idea of what one man was capable of shook me to my very being. We all know about the World War II and what happened to the Jews. We all know the mercenary behaviour of one man in the face of supremacy and the idea of creation of a, “supreme race”. Based on this, Far to Go has been written and I can only say one thing: I am glad that this book was written. Far to Go follows two parallel stories (one set in the year leading to the start of World War II and the other is set in the present). The narrative takes place through the months from 1938 to 1939, when Sudetenland in Czechoslovakia is handed over to Nazi Germany. This brings out turmoil in the city’s residents and one particular secular Jewish family of the Bauers. The Bauers – Pavel and Anneliese are living in peace and harmony till the invasion takes place. At the beginning they believe they will be safe as they aren’t practicing Jews. However, as events begin to unfold in front of their eyes, they decide to leave the country and protect themselves and their son Pepik. The book is told through the eyes of Pepik’s Nanny Marta, and the reader is able to see the devastating effect the painful decisions have on the Bauer family. The parents are unable to leave the country, so they send their son to Britain on the Kindertransport, to keep him safe. Kindertransport in those times was a program through which 10,000 children were sent to Non-occupied Nazi areas without their parents. Marta on the other hand is Non-Jewish and is confused with all the anti-Jewish sentiments and comments prevalent in the air. She meets Ernst, Pavel’s colleague secretly every night and gets influenced by Ernst’s comments and opinions, though she is fully aware of how the Jewish are just regular people. And yet she betrays the family she works for. I could understand Marta’s point of view to some extent. In the sense that she was lured and only wanted to impress Ernst and how she felt for him dictated most of her actions and drove her to be the person she wasn’t. While reading that, the questions that came to mind were: Is it so easy to betray the people you once liked and loved? How strong or weak are people in the face of circumstances? Who decides people’s fates then – other people or one man? Far to Go questions identity and race as well – What does it mean to wake up one fine day and discover that life isn’t the same anymore just because you belong to a certain race of people? How would we feel if that were to happen to us in today’s time and age? Alison Pick writes the book with great urgency and beauty. There were portions that overwhelmed me to such an extent that it was difficult for me to read further. Certain passages that spoke of the treatment vetted to Jews literally break the readers’ heart. The intensity of the writing comes from the fact that Alison’s grandparents were also survivors of World War II and fled from Czechoslovakia to Canada. I was deeply moved by the writing and my heart went out to characters more than once and I guess that is the beauty of powerful writing. Far to Go was nominated for the Booker Long List 2011, however did not make it to the short list. I am amazed at that. Nonetheless, Far to Go is a book that I will not forget in a long time to come. Far to Go is a moving, human tale of perseverance and sometimes of the difficult choices we make as humans. This entry was posted in Books, House of Anansi Press, Literary Fiction, Review and tagged Alison Pick, Far to Go, Hitler, House of Anansi Press, literary fiction, Nazi Regime, world war II on October 11, 2011 by thehungryreader.